Now with her oldest daughter ready to have a baby of her own, her youngest daughter ready to graduate from high school, and her new husband, Paul, ready to embrace the life of an empty-nester, Daisy feels like she might finally be able to check “motherhood” off her list of things to do. 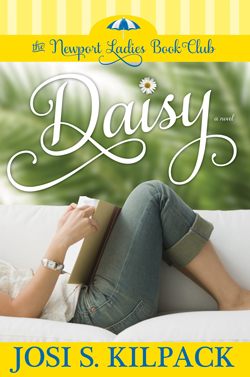 Looking for a distraction to escape the growing tension at home, Daisy joins the Newport Ladies Book Club, where she meets Paige, Athena, and Olivia—unlikely friends who offer encouragement and support when Daisy’s perfectly crafted life is turned upside-down. I am a huge Sadie fan and already believe Josi to be a great writer. But she really topped it in Daisy. I cried—more than once. Very good book, recommended to anyone who likes women’s fiction. 5 stars and a Whitney nomination from me. I’m enjoying this series. I am a little biased to the authors because I think every single one of those ladies are talented writers. Daisy is another viewpoint of the Newport Ladies Book Club. I enjoy the interaction and internalization of the characters. Can’t wait to read more! I really like how “true-to-life” this series is…battling real-life situations and helping each other through them…very inspiring!